Regarding an attached current representation contract from ProServ. 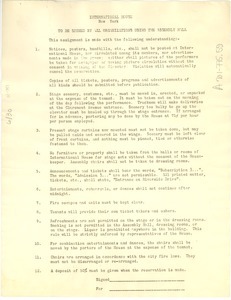 Attached is the contract that was for Ann Grossman. Would like them to note the attached in reference to income projections. The attached is a draft of the Wimbledon agreement with Waverly Fabrics. McCormack would like his thoughts on the attached. The attached is a memo and a draft contract being sent from Peter German to Ian Todd. The contract is for Dentsu covering the continuation of the Toyota World Match Play Championship from 1995-1997. Orlando (Fla.) - Would like him to transmit the attached contract, stating that the board of directors of TBHC, Inc. made a unanimous action without a meeting to sell property in Florida. Would like him to have Alastair Johnston check the attached Arnold Palmer contracts and then pass them on. Updating the contract that they had originally agreed upon between Vijay Singh and Forstmann Little and Company. Instead of the original two golf outing per year, they have changed it to only one golf outing per year. Attached is a copy of the original letter from June 7th, Vijay Singh's playing schedule, and a draft of the letter.